Scale: 1:48. 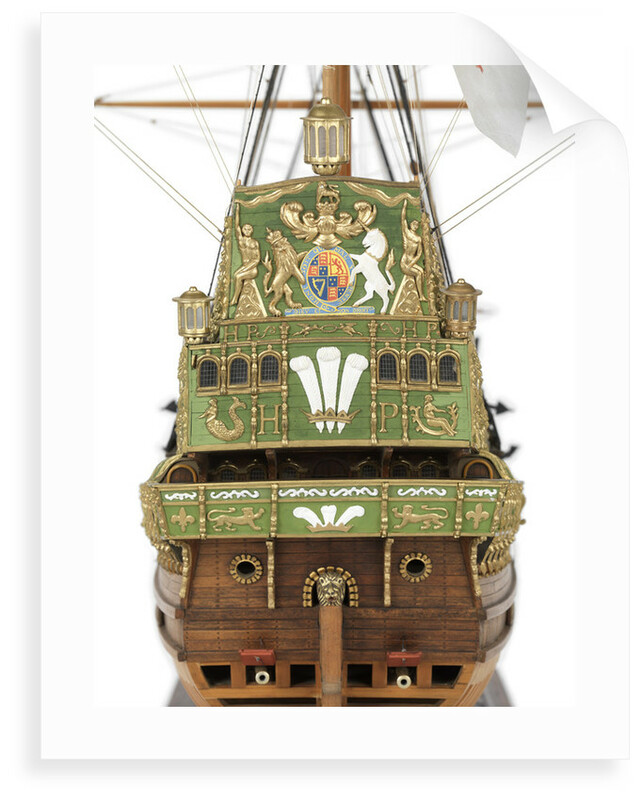 A full hull model of the 55-gun three-decker Prince Royal (fl.1610), made entirely in wood, built plank-on-frame in the Navy Board style, with metal and organic material fittings and partly painted. 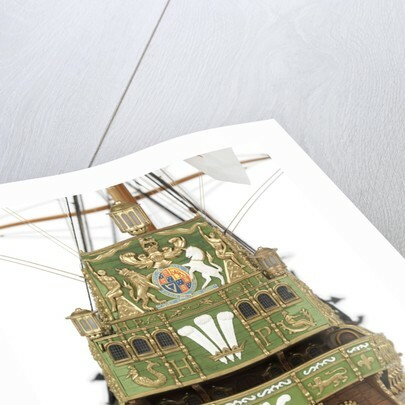 The depicted vessel is fully rigged on all four masts with a highly decorated hull, nearly all of which is based on the fine contemporary painting of her by the Dutch artist Adam Willaerts (see BHC0266 and BHC0267). The lower part of the hull is frame and the upperworks from just below the lower gundeck is planked and varnished. 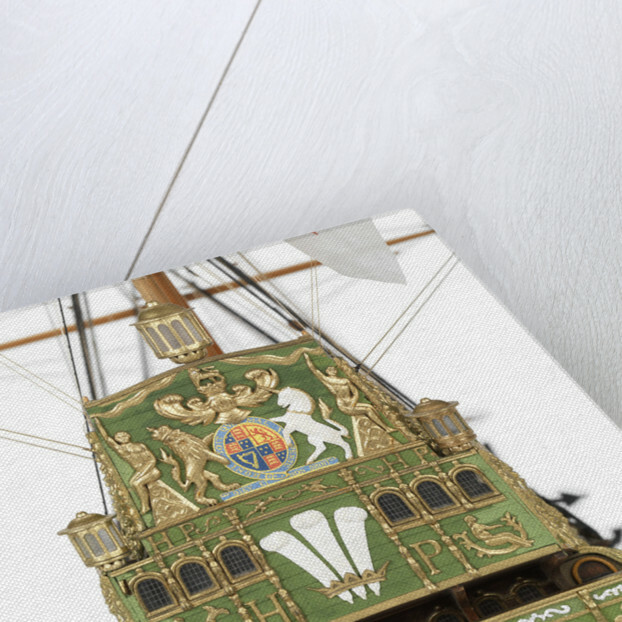 Decorative elements are mainly on a green ground with gold embellishments. The foremast and mainmast are square-rigged and the mizzen and bonaventure are lateen rigged. All standing and running rigging is shown with their yards and the bowsprit has a spritsail topmast. 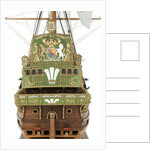 Other features include eight gunports on the lower gundeck, all but one of them closed on each of the port and starboard sides; open gunports on the main gundeck with guns rolled out; entry port on the port side main gundeck; flags of the Cross of St George flying from the spritsail topmast, foremast, mizzen, bonaventure and ensign staff, and a standard flying from the top of the mainmast; and decorated open stern gallery. 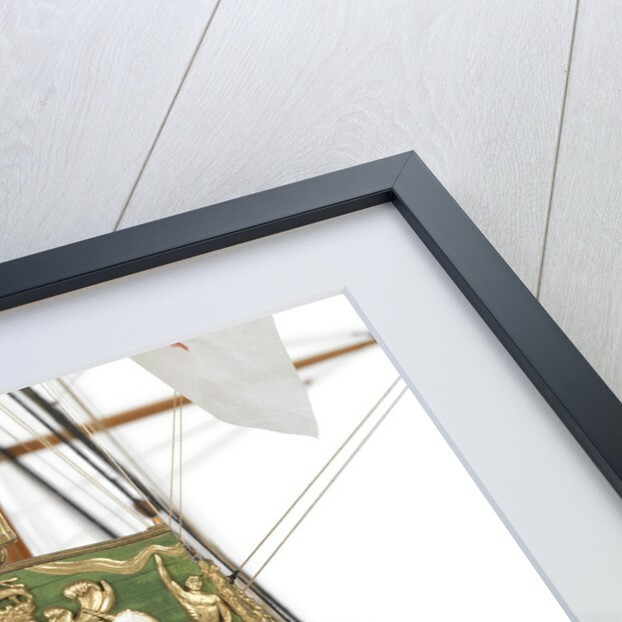 The model is mounted on a pair of light-coloured wooden supports and displayed on a rectangular dark wood baseboard with decoratively carved edges. More by the artist Basil Grenville Peter.